The procedure for purchasing a license is covered on this page. For information on AQT pricing and which license is appropriate for you, see the pricing page. When you purchase a license online, you are using our online reseller Element5. Queries about a particular purchase should be directed to them not to ourselves. 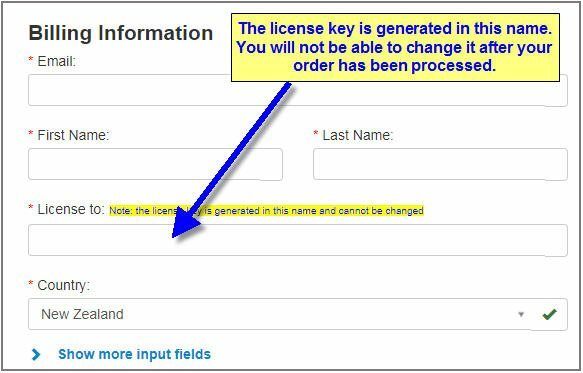 The license key will be generated in the name you enter into the field called License to on the Element5 purchase page. Enter the name of the organisation that will own the license you are buying. Do not use your own name unless you are making a private purchase. Make sure you get the license name correct! You will not be able to change it later. Where is my Element5 order? Most payments go though very quickly (in a few hours), but sometimes can take up to 24 hours. If you wish to check on the status of an order, contact Element5. You can check on the status of your order at http://www.element5info.com. If you have not received an email from Element5, contact us at sales@dbquerytool.com and we can check on the status of the order. Do not submit another order unless this is the advice we give you. A duplicate order cannot be cancelled without incurring a cancellation fee, which we will expect you to pay. This form will ask you for the Product ID - use the Product Number from the table on the pricing page. You can place a Purchase Order either on Element5 or on ourselves. you need to get a Purchase Order from your accounts department. EU business-customers must supply a VAT ID.